Amy – I’d really like to hear why didn’t you like the story. As much as I enjoyed the writing, I wonder if I would have liked the plot as much if it had been set somewhere else (say the West coast or New England). Was Nemesis your first Philip Roth novel as well? Hmm… it’s hard to say why I didn’t like it. I just found it so exclusionary. I see I am slow and you already found my review, so you already saw what I thought 🙂 I also just found it booooring! lol It was my first Roth, yes. And I felt like the odd one out while reading it because I know he is a huge name and that everyone loves his work! Enjoyed your writeup, Tara. I’m no big fan of Philip Roth, but the passage you quote here is pretty good. 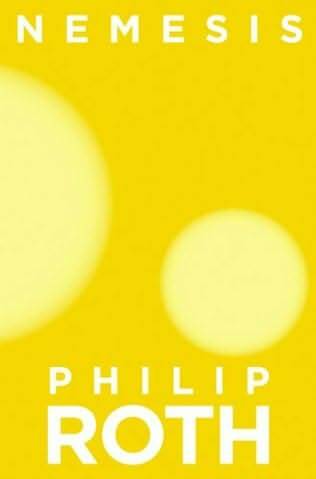 In my opinion, for whatever it’s worth, the best Philip Roth book was his first, Goodbye Columbus. All downhill from there. Thanks for the recommendation (and for stopping by). I’ve heard a bit about Goodbye Columbus and after reading some summaries of the stories in the collection…. is it strange that they remind me of Salinger’s Nine Stories? There’s another, shorter passage at the end of the book describing a sunset that I think you might enjoy more (from what I’ve read on LitKicks 🙂 ). Roth has this way (at least in Nemesis) of going from basic prose to these over the top, extravagant descriptions that completely throws me. But I like it. I’m going to try to pick up a copy of Goodbye Columbus at the used bookshop… if you’re interested I can let you know how it goes. I thoroughly enjoyed this book. Although I had heard about some of his other books, such as Portnoy’s Complaint and Goodbye Columbus, Nemesis is the first I’ve read. I was drawn to read it by a review that I read in a Jewish news publication. It has made me think. I plan to read his other works, perhaps starting from the beginning. Is there any way to communicate with Mr. Roth? Sorry for my delay in replying to your comment. Nemesis is part of a series of four short novels entitled Nemeses, which also include Everyman, Indignation and The Humbling. This is my first Roth novel, so I can’t really recommend any others – but I think if you enjoyed Nemesis those might be a good place to begin. As for communicating with the author, I would think there might be someway through the publisher – but I’m really not sure.